Tonight is the last night of Hanukkah, and my obsessive side is very satisfied to discover that I have exactly the right number of leftover candles accumulated over the past several years to fill our Hanukkah menorah. 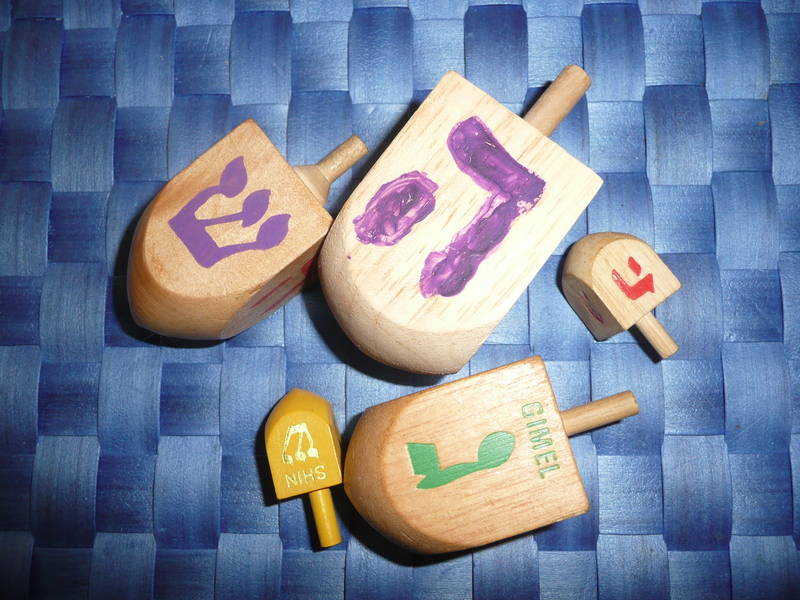 Each package of Hanukkah candles comes with exactly the right number to get you through the holiday. But in practice, at our house, each year we celebrate one or two nights at the homes of other families, and don’t light our own, so the extra candles roll around in my tea cupboard. This year, in deference to the economy and the state of the planet, we used the assorted candles left behind from past years. The mismatched theme seemed to fit our family: jazzy and colorful, if a little untidy. Hanukkah was appropriately low-key this year. We gave our teenagers glow-in-the-dark Silly Putty one night, and fuzzy pyjama pants another night. My husband contributed some cool light-up “party rats” that you clip on the end of each finger “for night blogging.” I’ll have to borrow those. On one night, instead of giving the kids gifts, we made a donation to our friends who run FairVote, a group trying to upgrade American democracy by getting rid of the electoral college. This is a political cause my teens understand and support. Another night, we gave our Hanukkah donation to the winter Special Olympics, the charity designated by my son’s ski club this season. Perhaps because this is my first Hanukkah in the blogosphere, I have been reading a lot (some of it disturbing, wise, funny) about the multiple meanings of Hanukkah. I realize that by emphasizing the “light in darkness” theme, I risk being accused of watering down or avoiding the historical and political origins of the holiday because I’m a half-educated half-Jew. Or worse, I could be accused of “settling for” the theme Hanukkah shares with Christmas and the solstice as part of a least-common-denominator homogenization, rather than wrestling with the distinctive and sometimes difficult meanings that are unique to Hanukkah. I am wrestling though. For instance, we have guests coming to celebrate with us tonight, so I printed out copies of the three English verses of Ma’oz Tzur as written out in gorgeous script years ago by my Episcopalian mother. (Note: rather sad that children cannot read cursive any more). This hymn has its origins in the 13th century, and it appeals to me because it seems to fulfill a requirement for ritual storytelling, and it emphasizes the theme of religious freedom, which appeals to me as a religious renegade. My family sings all three verses, because that’s the way we’ve done it for generations, and because it is somehow pleasurable to rub up against the difficulties of the text, like worrying a loose tooth with your tongue. We sing “and thy word broke their sword,” even though none of us believe that the almighty, if he/she exists, takes sides in (dubious) military battles. We sing “priests approved in suffering” even though it triggers uncomfortable associations with the victim mentality. And we even sing “children of the martyr race” in the final verse, even though it conjures up the deeply problematic “chosen people” issues, and the martyr complex, and the persistently pernicious idea that Judaism is a race (or even ethnicity). Someone has written a new, more politically-correct lyric to replace that last one..subbing in “children of the wanderers.” One year, I gently suggested this change, but my father, never a big change advocate, was staunchly opposed. So I have retreated to singing, and wrestling with, the old lyric. For one more night. And then it’s on to wrestling with Christmas. Party Rats! My kids are getting Party Rats tonight. Dont tell them. It must be in the collective unconscious. I am with your Dad about the lyrics. Dont mess with the tune. Dont mess with the words. Gimme that old tyme religion. Next PostNext Some Jews Love a Christmas Tree. But a Creche? Oy!